Sam Fout » HAPPY NEW YEAR! Geez do I ever update this thing? TONS of stuff coming up; stay tuned. 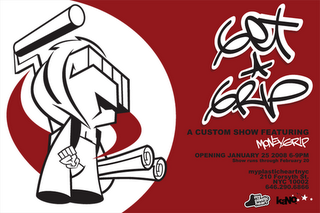 For now, if you’re in NY, check out the MONEYGRIP show at MPH’s gallery. I’ll post pics of my piece in a bit.